Preheat oven to 130°C. Line a sheet pan with baking paper. Draw a 20 cm circle on the baking paper. What I always do is, I draw around the outside of a pan that is about 20 cm with a pencil. Beat egg whites with salt on high speed in a big bowl until soft peaks form. Add the icing sugar gradually, while continuing to whip. You have to make sure that the sugar is completely dissolved. Once you are done put the corn starch on top with some cider vinegar and gradually fold in. Spread a layer of meringue to fit the drawn circle on the baking paper, approximately 6 cm thick. With the remaining mixture, spoon swirls around the edges to form a shallow bowl shape. Put the meringue into the preheated oven for about 60 Minutes. Afterwards turn off the oven, but leave meringue in the oven for an additional 15 minutes. In the meantime whip up the cream with the sugar in the big bowl. 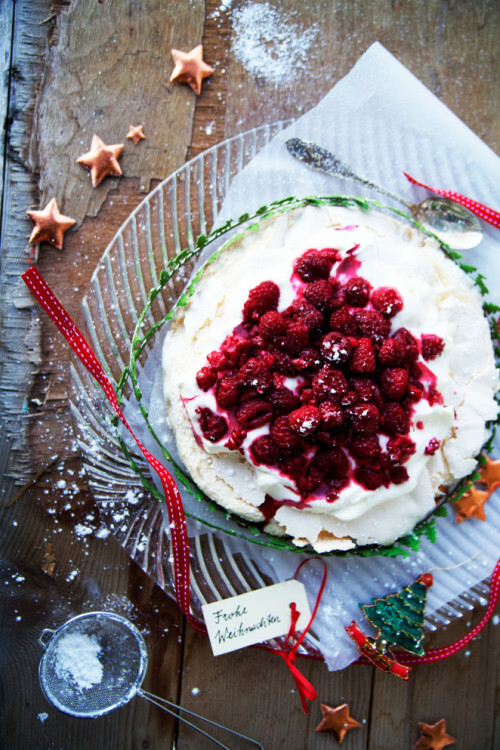 Decorate the meringue with vanilla ice cream, whipped cream and raspberries.